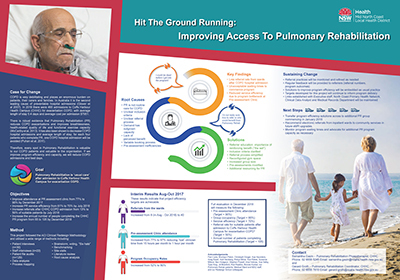 This project aimed to improve access to pulmonary rehabilitation and embed it as standard practice after admission to Coffs Harbour Health Campus for exacerbation of chronic obstructive pulmonary disease (COPD). To increase referrals of suitable patients to the Pulmonary Rehabilitation Program for people admitted to Coffs Harbour Health Campus with COPD, from 13 per cent to 50 per cent by July 2018. To increase the number of people completing the Pulmonary Rehabilitation Program at Coffs Harbour Health Campus each year, from 55 to 105 by December 2018. Allows significantly more COPD patients to access effective treatment. Improves health-related quality of life and functional exercise capacity for COPD patients, which also benefits patients’ carers and families. Reduces the risk of hospital admission and readmission for exacerbation of COPD. Improves patient recovery after hospital admission for exacerbation of COPD. Improves communication between medical, nursing and allied health teams caring for COPD patients. Provides significant cost benefits for Coffs Harbour Health Campus, by reducing avoidable COPD admissions and hospital bed days. Aligns to the Triple Aim principles of improving the patient experience of care, improving the health of populations, and reducing the cost per capita of health care. COPD is characterised by breathlessness and is a debilitating, progressive disease that is a major cause of global morbidity and mortality. In Australia, it is the second leading cause of preventable hospital admissions1. During 2016, there were 465 admissions to Coffs Harbour Health Campus for exacerbation of COPD, with an average length of stay 5.4 days and an average cost per admission of $7951. There is robust evidence that pulmonary rehabilitation reduces COPD exacerbations and improves breathlessness, health-related quality of life and functional exercise capacity2. It has also been shown to decrease COPD hospital admissions and average length of stay; for every four COPD patients who complete pulmonary rehabilitation, one hospital admission for exacerbation of COPD will be avoided3. Despite strong evidence for pulmonary rehabilitation, only 13 per cent of suitable patients were referred to the Pulmonary Rehabilitation Program after being admitted to Coffs Harbour Health Campus for exacerbation of COPD in 2016. Even with low referral rates from the wards, demand already exceeded the existing program capacity by 222 per cent. It was determined that improving access to pulmonary rehabilitation would enhance health-related quality of life for program participants, and reduce COPD admissions and hospital bed days. The inclusion criteria and referral process for the Pulmonary Rehabilitation Program were clarified. The pre-assessment clinic was relocated to a space adjacent to the gym and streamlined, with shorter appointments and reminder phone calls to improve attendance rates. Additional resources were sourced to run a third Pulmonary Rehabilitation Program group from January 2018, increasing program capacity by 50 per cent. In-service education was provided to key referrers including junior medical officers, physiotherapists and nurses, with information tailored to each discipline. Sessions focused on the benefits of pulmonary rehabilitation, inclusion criteria and referral processes for the program, and the importance of reinforcing benefits of pulmonary rehabilitation to their patients4. Ongoing education sessions will be provided every three months for junior medical officers (who rotate frequently) and every six months for physiotherapy and nursing staff. To promote continuing referrals, regular feedback about referral numbers and patient outcomes (de-identified) will be provided to referrers every two months4,5. The shared gym space was reconfigured to improve physical access and allow the group size to be increased from eight to nine participants. This involved removing underused equipment and purchasing a 70-inch wall-mounted monitor for interactive documentation of individual exercise programs. August 2017: Trialled pre-assessment clinic solutions. September 2017: Delivered education to key referrers. October 2017: Trialled larger class sizes in reconfigured gym. November 2017: Provided initial feedback to referrers about referral numbers and patient outcomes (de-identified), with ongoing feedback every two months. January 2018: Additional pulmonary rehabilitation group begins. July 2018: Interim project evaluation. December 2018: Full project evaluation. annual number of patients completing pulmonary rehabilitation (target 105). an increase in referrals from wards after COPD admission to 40, up from eight referrals during the same period in 2016 and 11 referrals during the same period in 2015*. *Percentages for referral rates depend on admissions data, which has an eight-week time lag. Stay true to the redesign process, it will take you where you need to go. Don’t be afraid of what you uncover when ‘lifting rocks’ in the diagnostics phase. Robust scientific evidence supporting your project is very powerful when advocating for change. When designing solutions, identify and involve key stakeholders. Expect unintended consequences of change. Accurate admissions data is surprisingly difficult to obtain. Strong sponsorship is vital for successful implementation. Page A, Ambrose S, Glover J et al. Atlas of avoidable hospitalisations in Australia: ambulatory care-sensitive conditions. Adelaide, SA: Public Health Information Development Unit, University of Adelaide; 2007. McCarthy B, Casey D, Devane D et al. Pulmonary rehabilitation for chronic obstructive pulmonary disease. Cochrane Database of Systematic Reviews 2015;23(2):CD003793. DOI: 1002/14651858.CD003793.pub3. Puhan MA, Gimeno-Santos E, Scharplatz M et al. Pulmonary rehabilitation following exacerbations of chronic obstructive pulmonary disease. Cochrane Database of Systematic Reviews 2011;10:CD005305. DOI: 10.1002/14651858.CD005305.pub3. Cox NS, Oliviera CC, Lahham A et al. Pulmonary rehabilitation referral and participation are commonly influenced by environment, knowledge, and beliefs about consequences: a systematic review using the Theoretical Domains Framework. Journal of Physiotherapy 2017;63(2):84-93. Helfrich CD, Damschroder LJ, Hagedorn HJ et al. A critical synthesis of literature on the promoting action on research implementation in health services (PARIHS) framework. Implementation Science 2010;5(82):1-20.